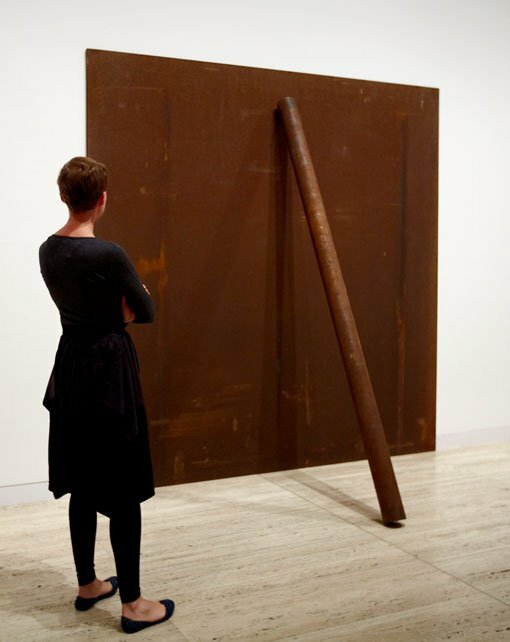 The Art Gallery of NSW has acquired Plate, Pole, Prop 1969-83, a classic 1960s sculpture by the celebrated Minimalist artist Richard Serra (born 1939 USA). This is one of only two works by Serra in Australia. The Prop , Serra’s other work in Australia, is in the National Gallery of Australia. The principle behind Minimalism was to make art works that rely entirely on the presence of their intrinsic material quality. There is no story and any expression is generated by the viewer engaging with this presence. Plate, Pole, Prop consists of a massive steel plate propped against the gallery wall by a steel pole. While the work is remarkable for its simplicity, its place in the Minimalist movement is critical to an understanding of the art that has come after it. The complexity of such a work comes with the realisation that the wall and the floor are integral parts of this work, dramatically registering the verticality of the wall and the horizontal plane of the floor. These two vectors define the space we occupy not just in a room but in the world where the horizontal becomes the horizon. The work emphasises how gravity points vertically downwards to the horizontal of the floor. This opposition is as much a part of the work as the steel itself. The balancing act of this great mass alerts us to the force of gravity and heightens our bodily sensation in the space before it. The viewer is in this way drawn into the completion of the art work the mass of which has to be felt to be understood. “If there was one glaring omission in our international contemporary collection, it was the lack of a great Richard Serra work. This is an important work from the classic period of Minimalism and will complement the other significant international works, including works by Sol Le Witt, Donald Judd, Frank Stella and Carl Andre. This is a convincing demonstration of the palpable power of simplicity,” said Edmund Capon, director, Art Gallery of New South Wales. The Gallery collection of International Contemporary art was begun with funds from the Mervyn Horton Bequest in 1984. This Richard Serra acquisition was made possible through The Art Gallery NSW Foundation and the Ruth Komon Bequest, in memory of Rudy Komon.